Each Chinese seal stone is 100% hand carved. 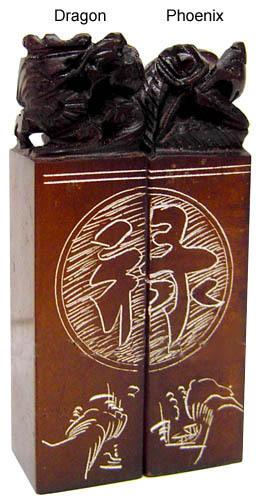 The dragon and phoenix symbols are carved on the top. 1) If you wish to purchase this pair of Chinese seal stones only (without your Chinese name carving on them), the cost is $38, and you may press the "Order" button to place this order.